Repeating a level is not the worst thing in the world for a prospect. 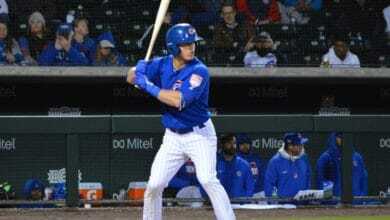 Albert Almora Jr. was at Tennessee for a year and a half before he finally made it to Triple-A and eventually Chicago. Former Cubs prospect Jeimer Candelario was sent from Myrtle Beach down to Kane County before he figured some things out. The key is that both learned to adapt to get to and through the next level. In 2019, several prospects will start next season at the same affiliate they played at in 2018. Pitcher Bryan Hudson could be one of those guys. The 6-foot-8 left-handed pitcher still has a lot of potential to be a groundball machine. However, he has not been able to put up consistent results from month to month. Last year at Myrtle Beach, Hudson had an ERA of 1.27 in July and a 7.29 in August. In spite of his inconsistencies, Hudson still remains a viable prospect who can still do very well. Here are five aspects of his game to watch this season. Hudson has three professional seasons at class A in his back pocket, so it’s hard to believe he’s only 21 years old. Despite that experience, he is still two years below the average age of most players in the Carolina League. I like the fact that the Cubs will let him work thorough things. New Pelicans pitching coach Brian Lawrence is known for making small adjustments that don’t necessarily have anything to do with changing a pitcher’s release point or delivery. Lawrence is more about focus and using the whole strike zone. Perhaps he can get inside Hudson’s head and help with an approach throwing strikes, preferably down in the zone. Hudson has gotten by for the most part with just a couple of pitches. It helps when one of them is a plus slurve, but he is going to need three pitches to move past Myrtle Beach and then thrive at Tennessee. Considering his size and unique athleticism, sometimes these things do take time. 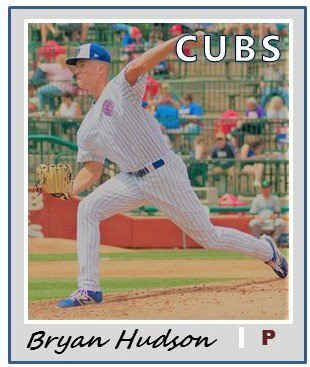 Hudson’s fastball, which was in the mid-80’s in rookie ball, hasn’t taken off like many thought it would over the course of his brief career (which is a notable issue for Cubs pitching prospects in general). He sat 90-91 last year, sometimes touching a bit higher. This is probably the key. Most pitchers who succeed in the minors tend to throw a large percentage of strikes, anywhere from 63 percent to the 70-ish range. Last year, Hudson threw 1,091 strikes out of 1,854 total pitches (58.8 percent). That’s got to improve. And though it seems like a significant jump, we’re only talking five more strikes per game, or 115 more strikes over an entire season. While the Pelicans had an outfield that could track down just about anything, their infielders struggled to plug holes and vacuum up grounders. That’s not exactly ideal for a pitcher with a 54 percent grounder rate, since it probably led to Hudson throwing more pitches under more duress than he should have. An improved defense behind him will help his numbers a good deal. When Hudson is on, like he was last July, he is one of the most fun pitchers to watch in the system. If has command his curve and fastball, hitters dink and doink balls into the dirt right in front of home plate. When he’s not on, however, it can be painful to watch him try to throw strikes. With his youth and athleticism, I just keep waiting for things to click for him. The delivery, the ability to throw strikes, and getting hitters to get themselves out is always there if Hudson does everything he is supposed on the mound.